Denise Crumble has lived in Riverwest for thirty-two years, and she is not someone who drifts through life taking events as they come. Her decision to move to Riverwest in 1979 was a characteristically considered one, with the aim of living in concert with closely-held principles while meeting her needs as a single mother. She was a student at UWM majoring in secondary education, raising her daughter Fatima, and pregnant with her son Bakeer when she moved into a building at Booth and Burleigh. The Kwanza principle Ujamaa – cooperative economics – has been a lifelong guide to Denise’s decisions. Riverwest had the (now defunct) Gordon Park Co-op, the Outpost, and a Riverwest Babysitting Co-op. The Babysitting Co-op, which operated on a point system similar to today’s Time Exchange, was especially important to her. Denise is the eldest of 13 children, so she learned early about sharing and cooperating. The babysitting co-op provided a way for her two children to experience a similar give and take so they’d be comfortable around all kinds of people and aware of the needs of others. She also wanted her children to experience life in an integrated neighborhood – another reason why Riverwest was a good fit. Her children’s circle of friends and neighbors expanded when Denise became a founding member of a housing co-op on Hadley Street. The arts community in Riverwest was also a factor in her decision to come here, and to remain. Denise has a passion for the arts and for the idea that creative artists in all disciplines should be able to make a living in the arts. She is a founding member of Arts Village, a group promoting the work of African-American artists. She has participated in the Philanthropy Incubator Project at Cardinal Stritch University, and is working on a “Giving Circle” project, also aimed at building a financial base for working artists by drawing upon a broad base of small donors. Denise wants to banish the stereotype that only wealthy people are, or can be patrons of the arts. While people of more limited means – like many of us in Riverwest – may not define themselves as donors or philanthropists, collectively we give significant support to many vital institutions. When Denise and I met to talk at Café Corazon, the staff admired her colorful hand-knit scarf. Denise told us who made it, and stressed that all of us can support the artists among us and be surrounded by beautiful things in the process. That moment illustrated the way Denise integrates all the things she cares about into her work, family life and volunteerism. Another issue that has engaged Denise as an activist and mother is reproductive rights and reproductive health. She fears that younger women take their access to birth control and abortion for granted. Denise can remember when a single woman couldn’t obtain birth control and a married woman needed her husband’s permission. When Denise worked as a lobbyist and fundraiser at Planned Parenthood, she sent both of her children to Human Sexuality classes there. Again, her penchant for conscious action and decision-making was at work. It was vitally important to her that her children had the knowledge they needed to make their own informed decisions about health and sexuality, and she wasn’t content to leave it to chance. Daughter Fatima was hired to serve as a peer educator after she completed the curriculum. 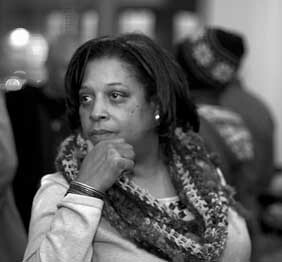 Prior to working at Planned Parenthood, Denise held jobs as the director of an alternative school at the Next Door Foundation, and as an arts administrator at the Inner City Arts Council. At Next Door the number of girls whose lives were altered by unplanned pregnancies alarmed her. And as the AIDS epidemic unfolded in the eighties, she saw the disease taking its toll in the arts community. These experiences fueled the commitment she has brought to her work in public health in the past decade. Denise worked at the Center for AIDS Intervention Research at the Medical College of Wisconsin. Now she works as a health educator managing a program that helps families prevent unplanned teen pregnancies and sexually transmitted infections. Denise’s approach to this challenging work is positive – not clinical or preachy. She doesn’t advocate scare tactics or spiritless delivery of information about birth control and diseases. She speaks about helping parents learn how to talk to their children about sexuality and about helping family members recognize and articulate their hopes and values. Denise knows from her own experience that when we know where we want to go – and what we want, for loved ones and ourselves – then we look for ways to get there, avail ourselves of help and fight obstacles placed in the way. All of Denise’s activism – in paid work and as a volunteer – has that consistent theme of recognizing the worth and power of individuals, and the need for unified collective action in the community. Denise has always fought to keep health care, health education, birth control and abortion protected and funded, so that each person can make healthy decisions that are right for them. She supports the arts and arts education, knowing that the arts nurture the hope and wholeness people need to carry on and thrive. Her work in the area of fundraising and philanthropy attests to her commitment to the long-term needs of the community. Taking the “long view” is especially meaningful and pleasurable to Denise now that her children are grown. Daughter Fatima works for Abbott Laboratories in Illinois. Her job planning the development and rollout of pharmaceutical products took her away to the Netherlands for two years, but Denise is happy to have her back in the area, since mother and daughter are close. Bakeer works as a production manager for a local Fast Signs franchise. Denise is also the deliriously proud grandmother of Isaiah (7) and Ivan (almost 3), the children of her son Bakeer and his wife Alicia. Though neither Fatima nor Bakeer lives in Riverwest now, Denise remains here. Their success and independence vindicate the decisions she made long ago to raise them here, and Riverwest is a congenial home for an endlessly busy and committed empty nester.